Small - $16.99 Only 9 left! Your son likes Captain America. He loves Iron Man, and he would love to be Hawkeye. But he doesn’t always side with the good guys. No he loves the Winter Soldier just as much as he likes Captain America. And he really, really loved Ultron. But he really took a liking to Crossbones in Captain America Civil War. He liked the knives that were attached to Crossbones arms, and the way he said, "I don't work like that no more," to Black Widow when she tried to zap him in the neck. Even his name is awesome: Crossbones. But most of all, your son loves his helmet, and armor. He loves the fact that Brock Rumlow is basically invisible in it. Let your son play the bad guy. 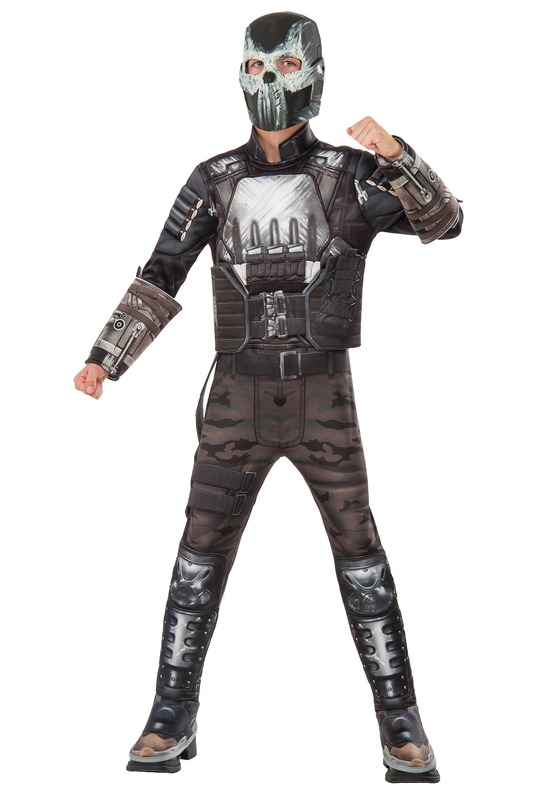 This Boy's Civil War Crossbones Deluxe Costume will make him feel like an ex HYDRA agent bent on making Captain America pay for what he has done to him. He will feel invincible in the black, and grey body suit. Like he could take on any Avenger, even the Hulk (if anyone could find Bruce Banner). Sure he loves to be the good guy in Iron Man's hot rod red suit with JARVIS in his ear, and Hawkeye who only needs a bow, and arrow to defeat bad guys, but every now, and again he doesn’t want to save the world. Sometimes he just wants to be the bad guy. But hey, it ain't personal.